Teaching a Sunday school class is more than just a Sunday morning job. It is a seven-day-a-week job. In this chapter we shall discuss at least some of the things that a teacher should do during the weekdays. 1. Continually study the lesson. In nearly every Sunday school what the lessons are to be about is known for weeks ahead of time. This allows the teacher to start studying the next lesson immediately after one lesson is presented. So much preparation should be done during the week that the teacher is simply filled with lesson material. He should know much more than he could ever teach in one class session. 2. Have a daily private devotion. It is entirely possible for one to be a good preacher and not to be a good Christian. It is also possible for one to be a good teacher and not be a good Christian. In other words, the mechanics of the lesson and the mechanics of teaching could be completely conquered, and yet if the teacher’s heart is cold, his teaching will be as sounding brass and tinkling cymbal. Every day at the same time a successful teacher will have a time of private devotion. This should include a systematic reading and study of the Word of God along with a season of prayer. In addition to this, each teacher should certainly lead his family in establishing family devotions. Some call this a family altar, some call it family worship. Whatever it is called, it should be done. The family should gather around in a family circle, read the Bible, and pray. At our house we sing a song, sometimes memorized a Scripture, sometimes we talk about character building, we all quote together our family motto, and we discuss the Scripture that has been read. 3. Have a pure thought life. 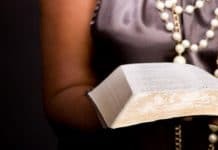 The Psalmist said, “Let the words of my mouth, and the meditation of my heart, be acceptable in thy sight, O Lord, my strength, and my redeemer” (Psalm 19:14). In Proverbs 4:23 the Lord reminds us, “Keep thy heart with all diligence; for out of it are the issues of life.” The Lord said of man, “For as he thinketh in his heart, so is he…” (Psalm 51:10a). Again the Psalmist said, “…cleanse thou me from secret faults” (Psalm 19:12b). To be a success in God’s work the heart must be right, the mind must be clean, and the heart must be pure. 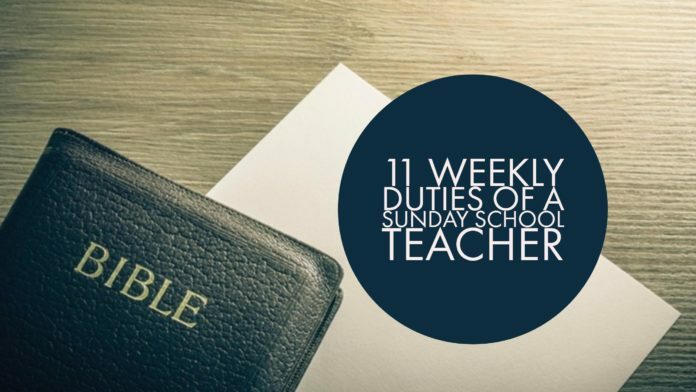 Unselfishness, sincere love for the pupil, and a desire to do all for the glory of God should certainly be the motive of every Sunday school teacher. Of course, he should want to build a big class, but this in itself should not be the main motive. This and other desires should all be subservient to the one desire of serving God and others. 5. Pray daily for each pupil. In order to have sufficient love one for another we must pray for each other. Love can never reach its ultimate unless prayer is included. One of the greatest things that one Christian can do for another is to pray for him. Certainly pupils of our Sunday school need to be on the prayer list of their Sunday school teachers. Pray for them and tell them that you do. 6. Visit in the homes of each pupil each quarter. There are many things that a teacher ought to know. Uppermost, however, is the knowing of the lesson and the knowing of the pupil. Just to know the lesson material is not enough; the teacher must know the pupil. When Ezekial was called as a captivity prophet and a watchman on the wall, the Lord led him to go where the people were and to sit where they sat for seven days. He could feel what they felt, hunger as they hungered, weep as they wept, and mourn as they mourned. If one is going to be a good leader, he must know the heart of the follower. Because of this, it is imperative that the teacher go into the home of each pupil at least once each three months. He may find needs that he never dreamed of before. Remember that the most important absentee is the one that was absent for the first time last Sunday. Remember that absentees are people, and no one ever became a chronic absentee that wasn’t absent the first time. They should be gotten back as soon as possible. It should certainly be a part of every teacher’s job to visit every absentee every week. If the class is too large for such an endeavor, it should be divided into groups with the responsibility given to group captains. In these days of population centers and population explosion, churches are becoming larger and larger, making it impossible for the pastor to pastor all of the people. There are simply too many people who need counseling, comforting, winning, helping, and visiting for the pastor to do it all. This makes it vitally important that each teacher pastor his pupils. He should have a personal concern for each pupil and should make this personal concern obvious to them. The pupils should feel that they could bring to him the most intimate problem or burden and that he would wisely advise and hold all in confidence. The teacher should let the pupil know that he is available at his request. Of course, in order to pastor the class properly, it becomes even more necessary that the absentees are visited and that the teacher enter into the home of the pupil regularly. If one teaches junior boys, it would be wise for him to go to the playground occasionally, watch a little-league ball game, find out his boys’ interests, play with them, and get to know them. He should get to know their likes and dislikes, their strengths and weaknesses, and their temptations and trials. It seems that in these uncertain days everybody needs help, but there are so few who know how to help. A teacher should be one of these who knows how to help and does so. 9. Have a monthly class meeting. The class should play together as well as study together. A little get-together each month is certainly helpful. Maybe the class could take a trip to the zoo, go to the teacher’s house for a meal, go down to the corner snack shop for a hamburger, have a picnic, or just have a simple little party. Whatever it is, the class should provide some recreation for its members. These are days when the world has everything to offer. Certainly the church should not forget to provide for the needs for the whole life of the individual. What better time could a child have than to get to know his teacher as he plays with him. A monthly get-together is a very vital part of class life. As I look back over my life, I thank God for those Sunday school teachers who prayed with me and played with me. 10. Make the classroom attractive. Not all churches have beautiful educational plants; however, the teacher should certainly do the best he can with what he has. In the first place, the class should be as neatly decorated as possible. A nice picture on the wall, a covering for the table, a vase of artificial flowers, and other forms of decoration are certainly in order. It is also advisable for the teacher to make preparation each week so the classroom will be a little different as if it were prepared especially for that particular Sunday. A simple rearranging of the chairs would be in order or maybe some fresh flowers would help. Maybe it would be nice to have something written on the blackboard. The words, “Welcome, pupils,” with the date would let them know the teacher prepared for their coming on that specific Sunday. One sure way to do the above is to arrive early enough every Sunday morning to check over the room and make certain it is ready for the pupils to enter. It is so important to make the class personal. The personal touch can make the difference between a successful class and an unsuccessful one. 11. Be a good Christian. Of course, there are other things that a teacher should do that all good Christians should do. He should tithe, be faithful to all of the services of the church, live a clean life, etc. Teaching is not just a Sunday job. It must consume our lives. It must be of utmost importance to us. The proper kind of Sunday school leadership will instill this in the hearts and minds of the teachers and officers.